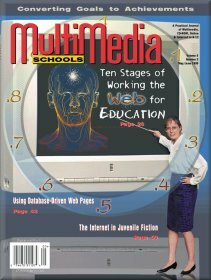 MultiMedia Schools  May/June 1999 © Copyright 1999, Information Today, Inc. In the summer of 1998, we were responsible for the technology component of a program for middle school students considered at risk of failing to meet the revised New York State Regents standards. The 1-month pilot Summer Prep School http://www.edteck.com/prep featured instruction in math, English, study skills, and technology designed to improve academic skills and performance. Team building and decision-making activities included Ropes training and indoor wall climbing. The focus of the school was to help students discover and work in closer alignment with their preferred learning styles. To engage academically at risk students entering the eighth and ninth grades in a summer school setting, and to design a program appropriate to their diverse technology skills. To enable students to more accurately reflect on their technology skills, as well as the skills of their peer group. To use technology in support of the schools integrated approach to math, English, and study skill instruction. To use technology to facilitate communication between school, students, and parents and to design projects that would showcase student technology skills and individual student progress. In the weeks prior to the start of the program, we debated the merits of a number of different program designs. We feared that if we didnt engage our students right away, we could run the risk of losing them or wasting precious class time teaching to the wrong skill level. It was critical to have an accurate picture of their technology skills and interests. Ultimately, we were able to get the information we needed by using a student self-assessment of technology skills. We developed a survey that asked students to assess their skills in 10 areas (see survey and results below). We based the survey on the Bellingham Public Schools Middle School Student Technology Outcomes posted at http://www.bham.wednet.edu/msmankat.htm. We revised their survey to target demonstrable skills that we planned to teach in our course. We posted the survey to a free online survey engine at Infotrieve. We established an account, chose a survey format, entered our survey questions, and then built an Internet link to our survey form. Students were given a hard copy of the survey to fill out and then asked to log their answers to the survey online They then submitted their results, which were instantly tabulated along with their classmates and displayed online in graphic form. We then asked students to view the class survey results online (see Tables). We used the rest of the first class period to brainstorm a course plan based on the feedback from the survey. Our class discussion focused on answering two questions: What do we know how to do? and What do we want to learn how to do? Thus, the students were able to assess and reflect both individually and collectively on the course design. For example, they felt that they had adequate skills in word processing, file management, and Web browsing. They felt they lacked skills and demonstrated a high interest level in PowerPoint and Web page creation. The student self-assessment and class reflection were invaluable to the design of the next 4 weeks of instruction. Our original plans had called for beginning with a unit on word processingan area in which 80 percent of our students claimed a skill level of 4. While the students may not have been as skilled as reported, as a group they thought they were. If we focused instruction in this direction, we werent going to engage them. Based on the assessment, we altered our plans. We devoted the first week in class to developing PowerPoint projects because 70 percent of our students responded, I do not know how to use PowerPoint. At the same time, they all expressed a strong interest in learning PowerPoint, especially after we demonstrated a sample presentation. We developed a PowerPoint assignment that would tap into their interests and build on their existing skills. Students were asked to log on to an Internet news site (http://cnn.com), open a word-processing program, summarize a news story, save it as a file, print it out, rewrite the summary in an outline format, save it as another file, and print it out. The outline summary would then serve as the basis for a PowerPoint presentation on My Interesting News Story. We provided PowerPoint instruction as each student reached that step in the project. This gave each student a chance to demonstrate some of the skills that he or she indicated in the surveybasic computer use and commands; file management; word processing; printing; and Internet browsing. It also allowed us to engage the more skilled students in a high interest PowerPoint project, while assisting the less skilled students in some of the more basic browsing, word-processing, and file management skills. We posted the results of the self-assessment survey on the Summer Prep School Web site. We invited parents and family members to complete the assessment and to reflect on their own proficiencies. This engaged summer school students and their families in a dialogue about their technology skills and the goals for the program. As students completed their PowerPoint projects, they were posted on the Web. Students and parents were able to see tangible evidence that the first learning goal identified by the students had been realized. Some parents sent encouraging e-mail to school in support of the approach. They appreciated the opportunity to share in their childs learning experience. Over the next 3 weeks, the technology program continued to target the areas identified by the students as high interest/low skills. For example, we gave the students the opportunity to demonstrate and improve their Internet browsing skills by going on an Internet Scavenger Hunt." We designed browsing tasks to reflect their interests, and we required them to keep a Word document open to record their findings in very specific formats. Example: Task 5: www.cdnow.com is an online music store. Using their site search, look up under title the album Waiting to Exhale. How much does cdnow charge for the CD? Type the price in size 12 Comic Sans MS font, underlined. Thus, we were able to engage and challenge the high skilled students while focusing instruction on the students at lower skill levels. Our final assignment was to teach an introduction to FrontPage 98 and assist each student in building a personal Web page. We encouraged students to build creative sites that highlighted many of the interests of the typical 13-year-old, but monitored the students closely to weed out personal information, inappropriate content, and links. This also gave us an opportunity to teach the students about responsible use issues and copyright. After each site was carefully checked, it was uploaded to the summer school Web site. Students also received copies on floppy disk. Throughout the 4 weeks, the technology course was also used to produce many of the projects developed in the other summer school classes. The Web site was updated daily with examples of student projects, photos from the class activities (Ropes and wall climbing), and reports to parents on instruction in each of the classes. The Web site became an online forum to measure the overall progress of the school. On the last day of school, the students once again took the online assessment. They now had the opportunity to reflect, as individuals and as a group, on how much they had accomplished in each skill area. That evening, the students hosted a final program showcase for their parents and families. They guided their guests around the open house, highlighting their project work from all the classesmath, English, study skills, and technology. Many took special pride in their ability to navigate our school Web site and to demonstrate proficiencies in the computer programs we had studied. From the responses to student and parent program satisfaction questionnaires, both the technology course and the summer school were a success. Students with diverse skills were fully engaged and challenged in the production of a variety of projects using word processing, PowerPoint, Internet browsing, and Web design. With the use of pre- and post-instruction self-assessments, students were able to measure their progress both individually and collectively. Most importantly, the surveys allowed students to be actively involved in their technology course design and to take more ownership of their learning. Their projects and assessments became the core of a Web site that communicated student progress to parents and family, allowing everyone to share in the learning experience. From our point of view, the self-assessments were invaluable. They provided us with a quick snapshot of our studentstheir skills and interest. The results of the first survey redirected us from an introductory unit in word processing to a project that was much better suited to our students skills and interests. The survey allowed us to more efficiently utilize precious instructional time. The surveys became the foundation of our technology course evaluation. While they cant be considered valid measurements of student skills, they offered insights into student perceptions of their progress. Comparisons of the two surveys show growth in most skill areas with a pronounced improvement in PowerPoint and Web Page Creationtwo major course projects (see graphs). In contrast, the survey result for e-mail showed no clear trends. This is the one skill area that we never had time to include in our instruction. Peter Pappas is the former director of the Pittsford Central Schools Summer Prep School and the former district coordinator for Social Studies K-12. He is the former ssistant Superintendent for Instruction at East Irondequoit CSD. He also consults and presents on technology, curriculum, assessment, and staff development. Jon Pearson is a 1996 graduate of Pittsford Central. He was one of four student interns at the summer school and is considering a career in teaching. Copyright © 1999, Information Today Inc. All rights reserved.